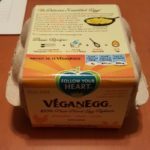 Our local Wegmans just did a full renovation and as a thank you to its customers, they featured several products at sale prices that were from 12 years ago when they opened! Pretty awesome, if you ask me. So, sea scallops were on sale for $9.99 a pound (fresh, wild, beautiful, local) instead of the usual 19.99 a pound. We bought 2 pounds of course. Have you ever had scallops at a restaurant, or even in your home, and you take a bite of this expensive and delicious seafood only to get a bite of gritty sand?!! It ruins the experience, doesn’t it? The answer for those of us cooking them at home…always clean your scallops REALLY well – also pull off any little rubbery/tough pieces that are stuck to the sides of the scallops (that is actually not supposed to be eaten). I usually rinse them in cool water several times to get any sand out of them and then I rinse them one last time for good measure. Make sure to thoroughly pat them dry or you’ll have too much water in the scallop when you try to cook them in the frying pan. This leads to a lack of golden coloring on the scallops when you try to pan sear them. Once they are clean and dry, you can season them with salt, pepper, and spices of choice (I use dill sometimes). You’ll get a frying pan, heat it up with a little oil in it – just enough so they don’t get stuck to the pan – and then add in your scallops. They should sizzle a bit when you place them in the pan. Also, space them out so they have room to cook. Once they are starting to change color from translucent to white and you can see some golden or light brown coloring on the bottoms (take a peek to check), add in your lemon juice and flip them over. Add a new drizzle of oil if needed. Now let them cook for a few minutes and you’ll know they are done when they are plump and no longer translucent in the middles. I like to serve these with a hearty vegetable. There are so many to choose from such as baked sweet potatoes, a lemony kale and jicama salad, or what we used for this recipe, collard green ribbons. Super easy to make and packed full of nutrients! They twirl like a noodle but are a carb free veggie. This meal was satisfying and delicious! Clean and prep your sea scallops. Clean them REALLY well by rinsing in cool water several times. Remember to pull off any little rubbery/tough pieces that are stuck to the sides of the scallops (that is actually not supposed to be eaten). Make sure to thoroughly pat them dry or you'll have too much water in the scallop when you try to cook them in the frying pan. This leads to a lack of golden coloring on the scallops when you try to pan sear them. Once they are clean and dry, you can season them with salt, pepper, and spices of choice (I use dill a lot because it compliments the seafood). Heat up a frying pan over medium to medium high heat with a 1 Tbsp of olive oil in it - just enough so they don't get stuck to the pan - and then add in your scallops when it is hot. Your pan should not be smoking, just sizzles if you drip a drop or two of water in it. The scallops should sizzle a bit when you place them in the pan. Space them out so they have room to cook. Once they are starting to change color from translucent to white and you can see some golden or light brown coloring on the bottoms (take a peek to check), add in the juice from 1/4 of your lemon and flip them over. Add a new drizzle of oil if needed. Now let them cook for a few minutes and you'll know they are done when they are plump and no longer translucent in the middles. Once finished cooking, you can squeeze another 1/4 of your lemon over the top or serve them with the lemon wedge on the side if you're not sure how your group feels about lemony flavors. Wash them well and pat dry. Remove stems by opening the flat leaves and running a sharp knife along both sides of the thick and fibrous stem, 3/4 of the way up; this will make them look connected at the tops but open like a narrow V at the lower half. Repeat for all the leaves. After the stems are out, fold your leaves in half vertically so the cut side is on your right and the sides of the leaf come together on your left. Roll the leaves up from top to bottom and it will look like a cylinder shape. Hold them steady and slice into rounds, which unravel into your ribbons/noodles! Some might be longer or shorter, that is okay. Add them to the frying pan you used for your scallops and add in the remaining olive oil. Cook over a medium heat. Sprinkle with a pinch of salt, pepper, and garlic. Give a stir with some tongs every minute or two. They should only need 3-5 minutes to cook. They will be bright green, shiny, and soft when done. 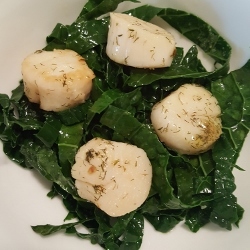 Put a nice 'heap' of collard ribbons on your bowl or plate, top with 4-5 scallops. Serve with a lemon wedge if you want.